Following the advent of vascularized organ transplantation in the 1950s, improvements in the techniques of transplant surgery and in the management of patient immunosuppression have significantly increased the success of organ transplantation and the practicality of using transplantation to treat end-stage organ dysfunction. These successes have brought about an increased demand for donor organs. The number of patients listed on transplant waiting lists has increased steadily; currently, more than 121,000 people are awaiting transplantation in the United States. [1, 2, 3, 4, 5, 6] Attempts to increase the donor supply have been insufficient to cope with this increased need. With this discrepancy, the number of patients who have died while awaiting transplantation has increased as additions to the waiting list far exceed donor availability and number of transplants performed, as demonstrated in the following image. Yearly number of organ transplants, patients on waiting list, and living and deceased donors. Source: United Network for Organ Sharing (UNOS). Significant attention has been devoted to the identification of other sources of organs for transplantation, but the mainstay of organ supply comes from deceased donor (cadaveric) donation. Nationwide, approximately 30% of all deceased organ donors come from trauma patients. The circumstances and mechanism of death in organ donors from 1999 to 2009 is shown in the images below. Evaluation of the trauma patient as a potential organ donor is critical to maximizing the availability of deceased donor organs for transplantation. 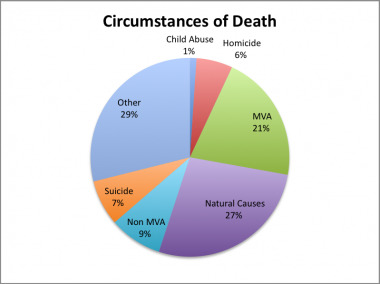 Circumstances of clinical brain death in organ donors, 1999-2009. MVA = motor vehicle accident. Source: United Network for Organ Sharing (UNOS), 2009. Physiologic complications in organ donors. DIC = disseminated intravascular coagulation. Source: University of Pennsylvania. Regional transplant centers have different sets of absolute and relative criteria for excluding potential organ donors. Early criteria were fairly strict, limiting evaluation to ideal donors aged 10-50 years with no comorbid conditions. With the increasing demand for organs, donation from an expanded donor pool has loosened restrictions considerably. Organs are harvested routinely from patients younger than 10 years and older than 50 years. Previously, such factors as hepatitis C or active bacterial infection were absolute contraindications. Now, such donors are often used for specific recipients. Relatively few absolute contraindications exist, and most potential donors are reviewed on a case-by-case basis. Additional absolute and relative contraindications are assessed for donation of specific organs. To confirm the diagnosis of clinical brain death, several additional diagnostic modalities may be employed. The confirmatory test can be repeated after an interval of 2-24 hours so that observer error can be avoided and persistence of the clinical state can be documented. Diagnostic tests include electroencephalogram (EEG), isotopic flow study, and transcranial Doppler. Under some circumstances, the family of a trauma patient may wish to withdraw care from a critically injured patient who is unlikely to make a meaningful recovery. Although these patients may not meet criteria for brain death, the family may wish for donation. In these cases, procuring organs from the non–heart-beating donor is possible. Exact guideline protocols are established regionally or at individual institutions but involve the withdrawal of mechanical support followed by rapid organ procurement after the clinical pronouncement of death. The manner in which this occurs is of great ethical and practical debate. The Uniform Anatomical Gift Act of 1968 requires explicit consent for organ donation. This act was revised in 1987 and then again in 2006 to better reflect current practices and encourage organ donation. [11, 12] In its current form, this act reaffirms that if a donor has gifted organs, their wishes should be honored and the family need not give additional consent. It also expanded the list of people able to consent for organ or tissue donation if a potential donor has not registered their wishes before death. The Uniform Anatomical Gift Act requires that hospitals notify organ procurement organizations of patients who have died or are near death. In 2003 the Organ Donation Breakthrough Collaborative was formalized by the US Department of Health and Human Services in response to the organ shortage. The goal of this collaborative is to achieve donation rates of 75% or greater where possible. Treatment of the trauma patient continues in the manner deemed optimal for the injuries sustained, until the determination of brain death. After this determination, treatment is directed at maintenance of organ function, while familial consent for organ donation is sought or until mechanical support is withdrawn. The donor is managed with intensive care unit (ICU)–level care as the evaluation proceeds. Care is directed at preservation of the donor's hemodynamic state, protection of the donor organs, and avoidance or treatment of complications that are observed in the brain-dead donor. In addition to common problems observed in patients who are critically ill, many pathologic states are observed frequently in the patient who is brain dead. As the time from brain death to organ procurement increases, so does the number and severity of complications. Common complications present in these patients are noted in the image below. In particular, donors who are brain dead are vulnerable to the effects of diabetes insipidus, cardiac arrhythmia, and endocrine dysfunction. Diabetes insipidus and its resultant sequelae (ie, hypovolemia, hypernatremia, hypokalemia, hyposmolarity) are managed with pitressin or desmopressin acetate (DDAVP). This treatment has been shown to delay asystole following brain death from 2 days to 3 weeks. Brain death is associated with disruption of the hypothalamic-pituitary axis. Donors can display adrenal insufficiency, lack of glycemic control, and hypothyroidism. Empiric steroids often are used, and management of other conditions follows clinical presentation. Previously, ultrarapid progression from declaration of brain death to procurement was advised. Currently, there is a shift toward greater optimization of donor physiology prior to procurement. This also enables more precise coordination with recipient institutions and lessens cold-ischemia time. Vitals - Monitor blood pressure, pulse, central venous pressure (CVP), and pulse oximetry hourly or more frequently as needed. Temperature - Monitor every 2 hours and use cooling or warming blankets to maintain temperature at 97-100°F. Maintain systolic blood pressure greater than 100 mm Hg with minimal inotropic support (eg, dopamine, neosynephrine, Levophed). Ensure the urine output is at least 100-300 cc/h. Ensure that pO2 is at least 100 mm Hg on the least amount of FiO2. Adjust intravenous (IV) fluid to maintain CVP of 4-12 mm Hg and urine output of 1-3 cc/kg/h. Treat diabetes insipidus (DI) - Suspect DI if urine output is greater than 3 cc/kg/h with urinary specific gravity of less than or equal to 1.005. Treat with DDAVP or vasopressin. Do not administer within 4 hours of procurement. Maintain CVP at 4-12 mm Hg, as tolerated by patient hemodynamics. Electrolytes - Correct electrolyte abnormalities as observed; elevated sodium is associated with adverse outcomes in liver transplantation. Steroids - Administer 15-30 mg/kg Solu-Medrol every 8-12 hours; this has been shown to increase the number of organs transplanted from each donor. Correct coagulopathy and transfuse blood to hematocrit (HCT) of 30 or greater. Administer empiric cefazolin or equivalent. The organ procurement procedure requires careful coordination of several surgical teams. Commonly, teams are sent from each of the institutions of the designated recipients to the location of the donor. Separate teams for heart, lung, and abdominal organs participate. The harvest operation is conducted in defined steps to minimize the warm ischemic time of removed organs, and the organs are removed in the order of their susceptibility to warm ischemic damage. Because of the short time available for transplanting the preserved organs, particularly for heart and lungs, the preparation of the potential recipients and transplant teams also must be coordinated. The recipient operation often commences prior to the actual arrival of the organ at the recipient institution. Prior to the operation, the donor must be adequately volume resuscitated and prepared for surgery. The management of intracerebral edema prior to brain death and resulting diabetes insipidus often results in a hypovolemic state that must be corrected prior to harvesting organs. The donor is volume resuscitated and brought to the operating room where appropriate positioning, monitoring, and ventilation are ensured prior to incision. Following this preparation, and when each team is in attendance, the procedure can begin. The outline of the surgical procedure is summarized below. An incision from the suprasternal notch to the pubis is made; then, the chest is opened via median sternotomy, and the abdominal cavity is entered. The thoracic and abdominal cavities are examined by respective teams for evidence of occult pathology and gross suitability of organs for transplant. The small bowel is retracted, the right colon is mobilized, the posterior peritoneum is incised, and the duodenum and pancreas are reflected, allowing exposure of the inferior vena cava (IVC) and aorta. Attachments of the heart, lung, liver, kidneys, and pancreas are incised; the organs are readied for removal. The aortic arch, IVC, abdominal aorta, and portal vein or tributaries are cannulated for infusion of the preservative solution. The aortic arch and supraceliac abdominal aorta are cross-clamped. A cold preservative solution (typically University of Wisconsin solution) is infused through the inferior aortic, portal, and cardiac cannulae, with drainage of effluent via the IVC. The thoracic and abdominal cavities are packed with ice. The organs are removed to the back table for initial preparation and packaging for transport. Organ Procurement and Transplantation Network. Available at http://optn.transplant.hrsa.gov/. Accessed: January 5, 2016. Tuttle-Newhall JE, Krishnan SM, Levy MF, et al. Organ donation and utilization in the United States: 1998-2007. Am J Transplant. 2009 Apr. 9(4 pt 2):879-93. [Medline]. Wolfe RA, Merion RM, Roys EC, Port FK. 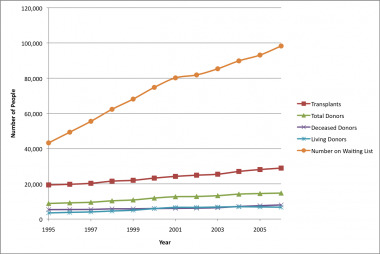 Trends in organ donation and transplantation in the United States, 1998-2007. Am J Transplant. 2009 Apr. 9(4 pt 2):869-78. [Medline]. 2007 Annual Report of the U.S. Organ Procurement and Transplantation Network and the Scientific Registry of Transplant Recipients: Transplant Data 1997-2006. Health Resources and Services Administration, Healthcare Systems Bureau, Division of Transplantation, Rockville, MD. Available at http://optn.transplant.hrsa.gov/data/annualReport.asp. Accessed: January 21, 2010. 2008 Annual Report of the U.S. Organ Procurement and Transplantation Network and the Scientific Registry of Transplant Recipients: Transplant Data 1998-2007. U.S. Department of Health and Human Services, Health Resources and Services Administration, Healthcare Systems Bureau, Division of Transplantation, Rockville, MD. Available at http://optn.transplant.hrsa.gov/data/annualReport.asp. Accessed: January 21, 2010. Tong A, Jan S, Wong G, Craig JC, Irving M, Chadban S, et al. Rationing scarce organs for transplantation: healthcare provider perspectives on wait-listing and organ allocation. Clin Transplant. 2013 Jan-Feb. 27(1):60-71. [Medline]. Tsuang WM, Chan KM, Skeans MA, Pyke J, Hertz MI, Israni AJ, et al. Broader Geographic Sharing of Pediatric Donor Lungs Improves Pediatric Access to Transplant. Am J Transplant. 2015 Nov 2. [Medline]. Brooks M. New Policy Could Expand Access to Pediatric Lung Transplants. Reuters Health Information. Available at http://www.medscape.com/viewarticle/854043. November 09, 2015; Accessed: January 5, 2016. Hernadez-Alejandro R, Wall W, Jevnikar A, Luke P, Sharpe M, Russell D, et al. Organ donation after cardiac death: donor and recipient outcomes after the first three years of the Ontario experience. Can J Anaesth. 2011 Jul. 58(7):599-605. [Medline]. [Guideline] Gries CJ, White DB, Truog RD, Dubois J, Cosio CC, Dhanani S, et al. An official American Thoracic Society/International Society for Heart and Lung Transplantation/Society of Critical Care Medicine/Association of Organ and Procurement Organizations/United Network of Organ Sharing Statement: ethical and policy considerations in organ donation after circulatory determination of death. Am J Respir Crit Care Med. 2013 Jul 1. 188(1):103-9. [Medline]. Verheijde JL, Rady MY, McGregor JL. The United States Revised Uniform Anatomical Gift Act (2006): new challenges to balancing patient rights and physician responsibilities. Philos Ethics Humanit Med. 2007 Sep 12. 2:19. [Medline]. [Full Text]. Iltis AS, Rie MA, Wall A. Organ donation, patients' rights, and medical responsibilities at the end of life. Crit Care Med. 2009 Jan. 37(1):310-5. [Medline]. Rosendale JD, Kauffman HM, McBride MA, et al. Aggressive pharmacologic donor management results in more transplanted organs. Transplantation. 2003 Feb 27. 75(4):482-7. [Medline]. Azevedo E, Teixeira J, Neves JC, Vaz R. Transcranial Doppler and brain death. Transplant Proc. 2000 Dec. 32(8):2579-81. [Medline]. Brayman KL, Vianello A, Morel P, Payne WD, Sutherland DE. The organ donor. Crit Care Clin. 1990 Oct. 6(4):821-39. [Medline]. Bresnahan MJ, Mahler K. Ethical debate over organ donation in the context of brain death. Bioethics. 2010 Feb. 24(2):54-60. [Medline]. Brown RS Jr, Higgins R, Pruett TL. The evolution and direction of OPTN oversight of live organ donation and transplantation in the United States. Am J Transplant. 2009 Jan. 9(1):31-4. [Medline]. California Transplant Donor Network. Guidelines for evaluation and clinical management of adult organ donors. Available at http://www.ctdn.org/downloads/ManagementGuidelines.pdf. Accessed: January 21, 2010. Dictus C, Vienenkoetter B, Esmaeilzadeh M, Unterberg A, Ahmadi R. Critical care management of potential organ donors: our current standard. Clin Transplant. 2009 Dec. 23 suppl 21:2-9. [Medline]. Englesbe MJ, Shah S, Cutler JA, et al. Improving Organ Procurement Travel Practices in the United States: Proceedings from the Michigan Donor Travel Forum. Am J Transplant. 2010 Jan 5. epub ahead of print. [Medline]. Gridelli B, Remuzzi G. Strategies for making more organs available for transplantation. N Engl J Med. 2000 Aug 10. 343(6):404-10. [Medline]. Jafar TH. Organ trafficking: global solutions for a global problem. Am J Kidney Dis. 2009 Dec. 54(6):1145-57. [Medline]. MacLean A, Dunning J. The retrieval of thoracic organs: donor assessment and management. Br Med Bull. 1997. 53(4):829-43. [Medline]. New England Organ Bank. Available at http://www.neob.org/. Accessed: January 21, 2010. Nygaard CE, Townsend RN, Diamond DL. Organ donor management and organ outcome: a 6-year review from a level I trauma center. J Trauma. 1990 Jun. 30(6):728-32. [Medline]. Pina J, Martins M, Morujao N. Absence of bronchial secretions in brain stem death. Transplant Proc. 2000 Dec. 32(8):2582-3. [Medline]. Razek T, Olthoff K, Reilly PM. Issues in potential organ donor management. Surg Clin North Am. 2000 Jun. 80(3):1021-32. [Medline]. United Network for Organ Sharing. Available at http://www.unos.org/. Accessed: January 21, 2010. Mechanism of death in organ donors, 1999-2009. SIDS = sudden infant death syndrome. Source: United Network for Organ Sharing (UNOS), 2009.